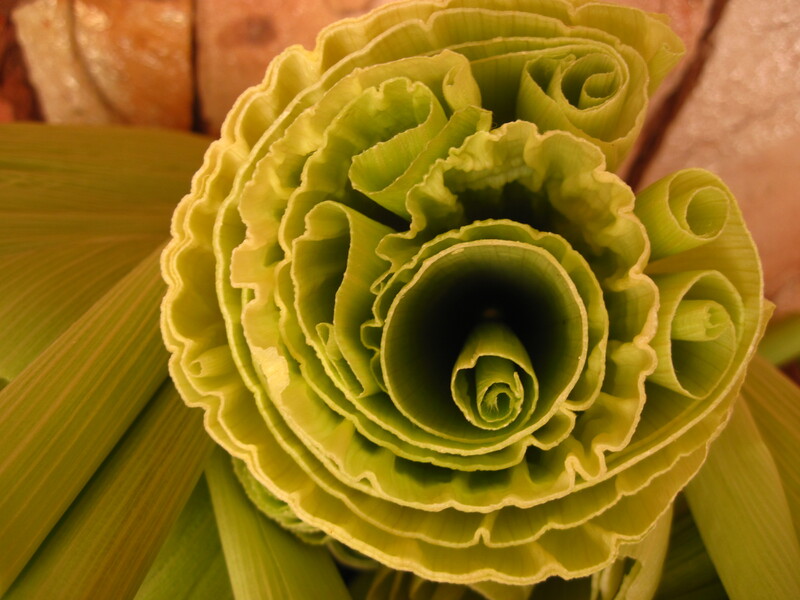 Every culture has a cultural dish that is as much for food as it is for socializing. In Papua New Guinea, it was the mumu. In North Carolina, it might be BBQ. Here in Anápolis (at least for today), it is pamonha (rhymes with pneumonia). I had only had this Brazilian specialty once before. 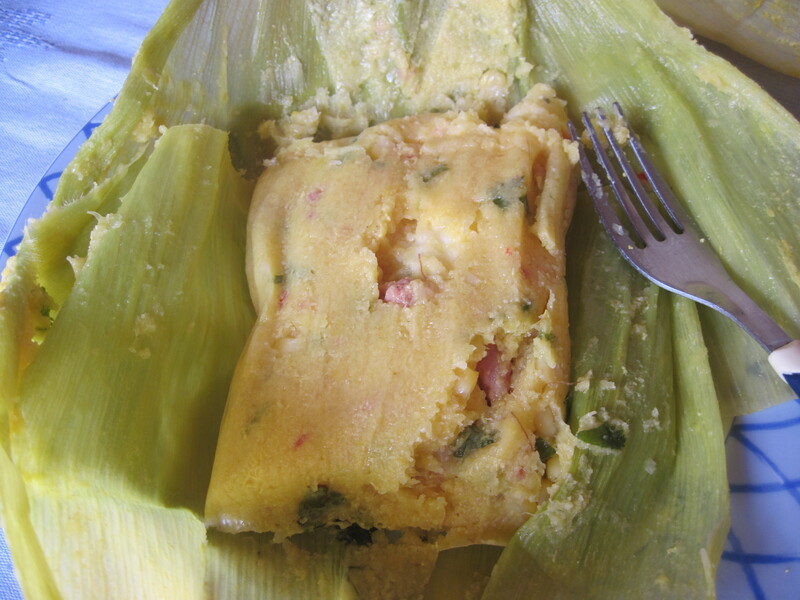 It’s something akin to tamales–corn based mix cooked in corn husks. But I never knew the process was so involved. Here’s what we did, with a few tips for trying it yourself. We started at 9am with two boxes of raw corn in the husks. Our host had actually started out a lot earlier than that by going to market around 6:30am and buying the freshest ingredients he could find. But us, Americans, arrived at 9 to help. One of the men cut the end off of each cob. Cutting corn with a machete is a great way to start your day. Be sure your machete is sharp. 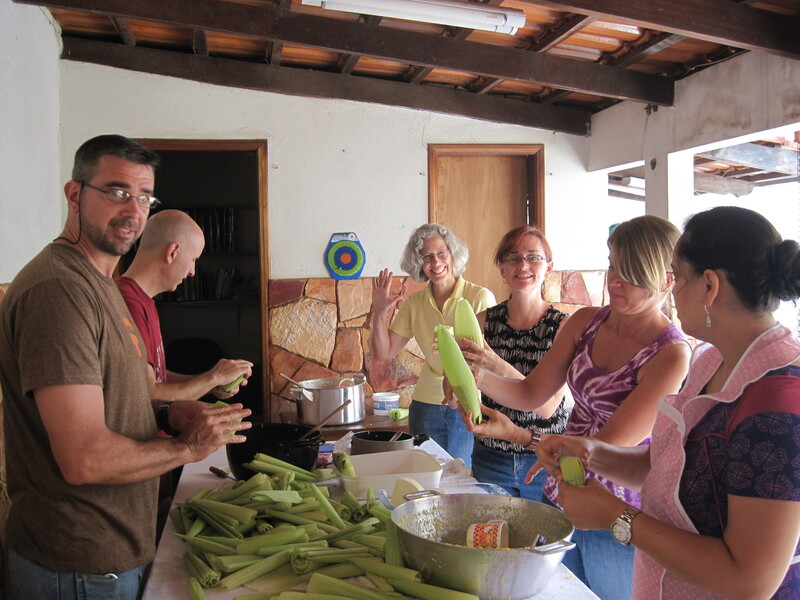 Then it was up to the rest of us to peel the husks off the corn, saving any outer layers that were relatively clean and in good shape to wrap the food in later. Have your kids help with this. We were inevitably going to find bugs. The kids were terrified of this at first, but after we found a few caterpillars, they started viewing the bugs as friendly (as long as they didn’t have to touch it). Politely ask them to move aside. After about an hour of shucking corn, we took a coffee/breakfast break. Always give yourself time to stop and eat while preparing food. 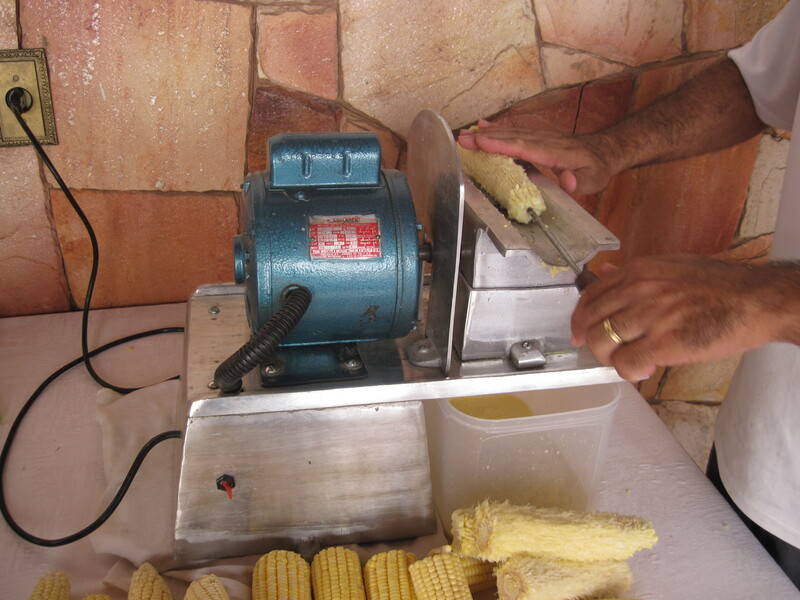 Back to making pamonha, we had to clean the corn and cut off any bad spots before running each cob over a machine that grinds the kernels off of it. Good luck finding a machine like this in America. Maybe someone in Kansas would know of one. When all the corn has been run through the machine, we had something with the consistency of creamed corn. Imagine 2 pots this size of it. That’s a lot of cream-like corn. Meanwhile, in the kitchen, the hostess was cooking up sausage (removed from the skin) and pork fat. 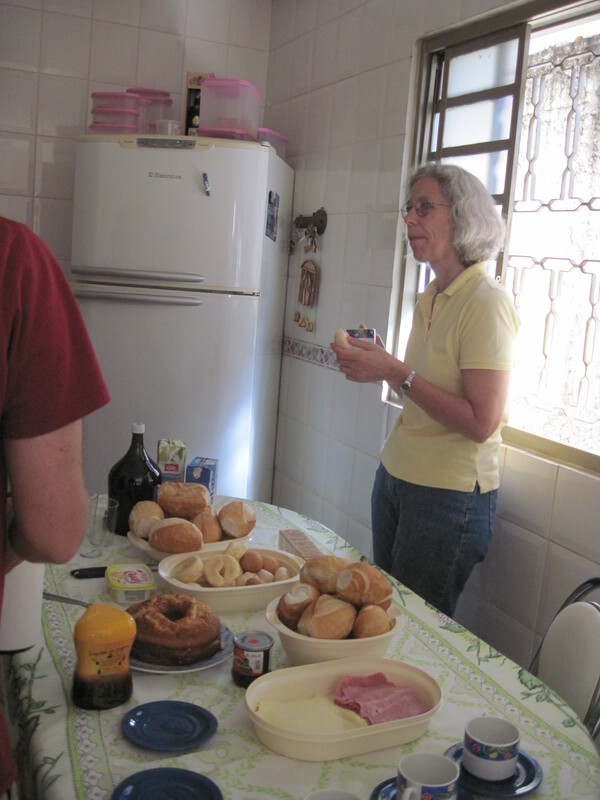 Somewhere around here, we took another break: coffee, goiabada (imagine a something that looks like a small cake and tastes like a guava fruit roll up), and queijo fresco (fresh cheese). 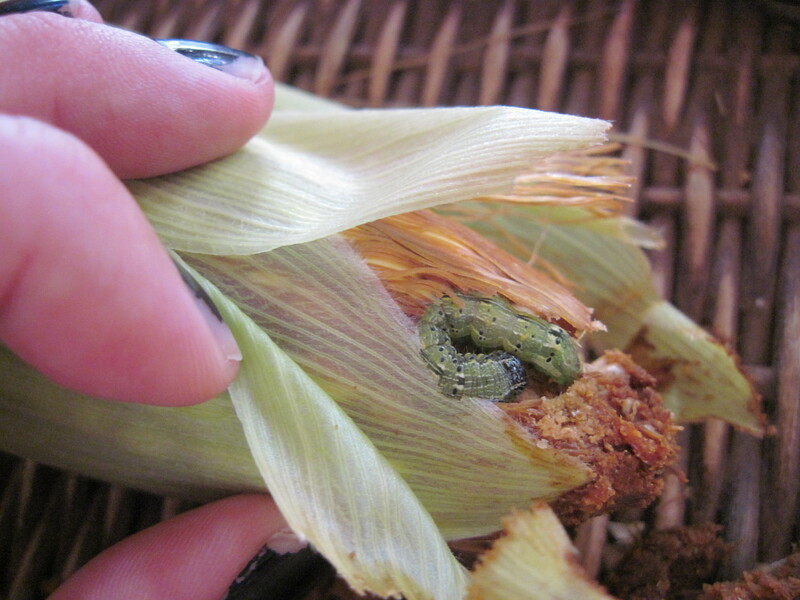 I started taking pictures of the hundreds of corn husks we were saving for wrapping the pamonha in. They’re very photogenic. Then it was back to preparing the food (again). 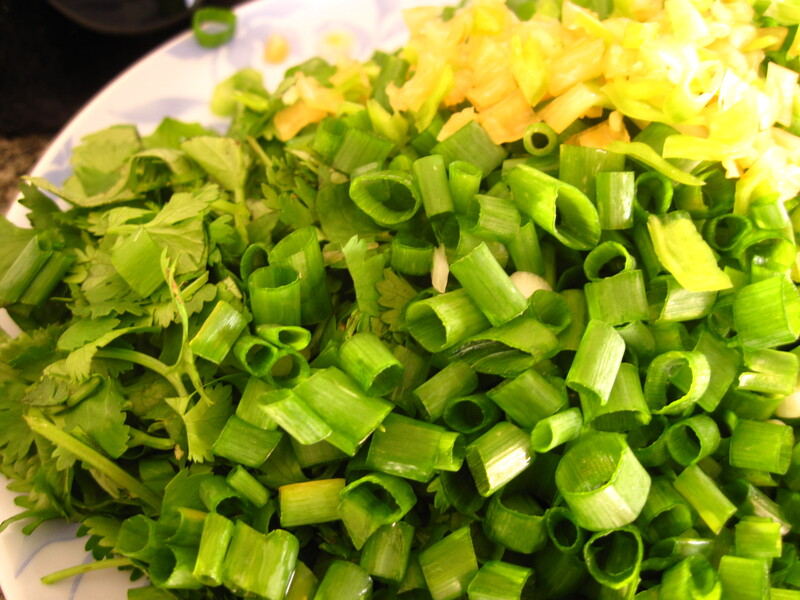 One of the ladies cut up cilantro, green onion, and some hot peppers to put in the pamonha. 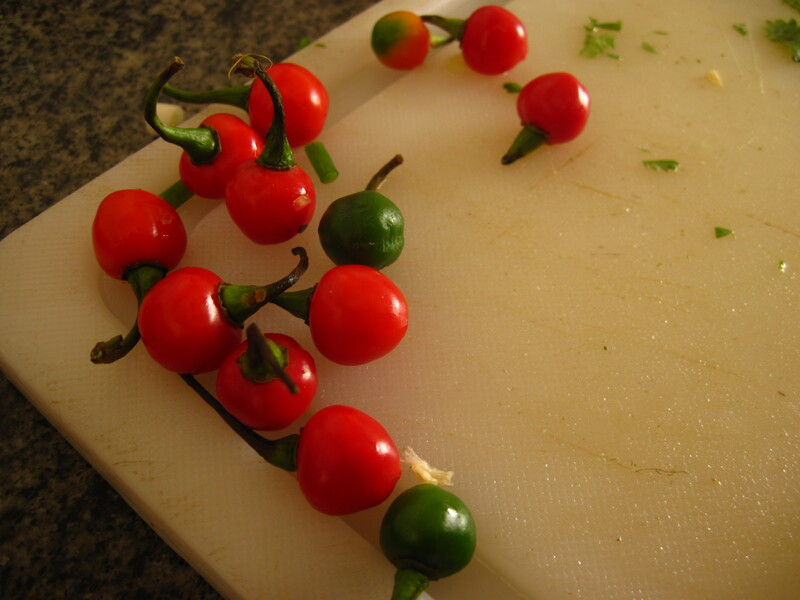 They may be small, but these little peppers pack a punch. Those of us who were not cutting up fresh ingredients were sitting outside, enjoying the break. 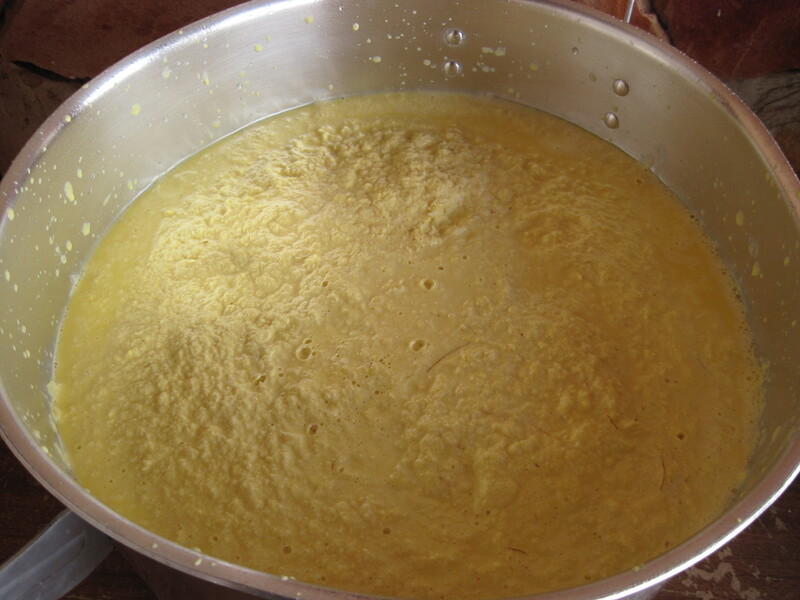 From inside the kitchen, someone called out, “Hot fat coming out!” Then out came our host with a pot of heated pork fat to pour on our corn mixture. The fresher the cheese, the better. At this point, we decided to make three different kinds of pamonha: doce (sweet), sal (salty), and amoda (the house recipe). So we split the corn mixture into three giant pots. We added salt and sugar to all three, but in varying amounts. 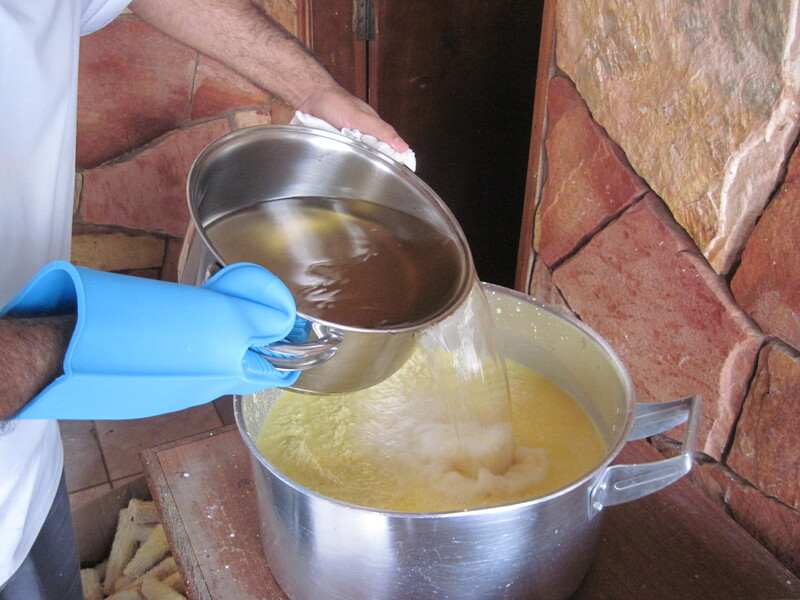 This is the sugar being added to the doce pot. 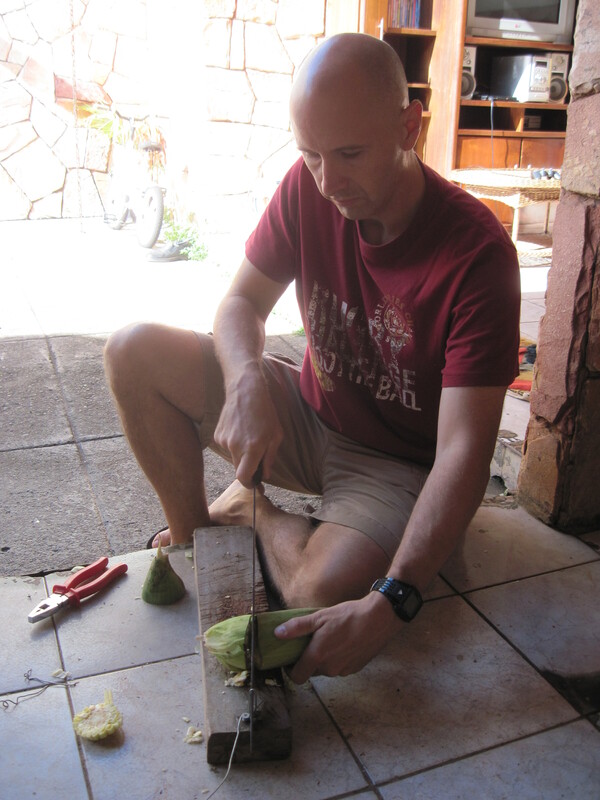 Not many people in Brazil actually measure ingredients out the way we do in the states. Just dump, taste, and dump some more. 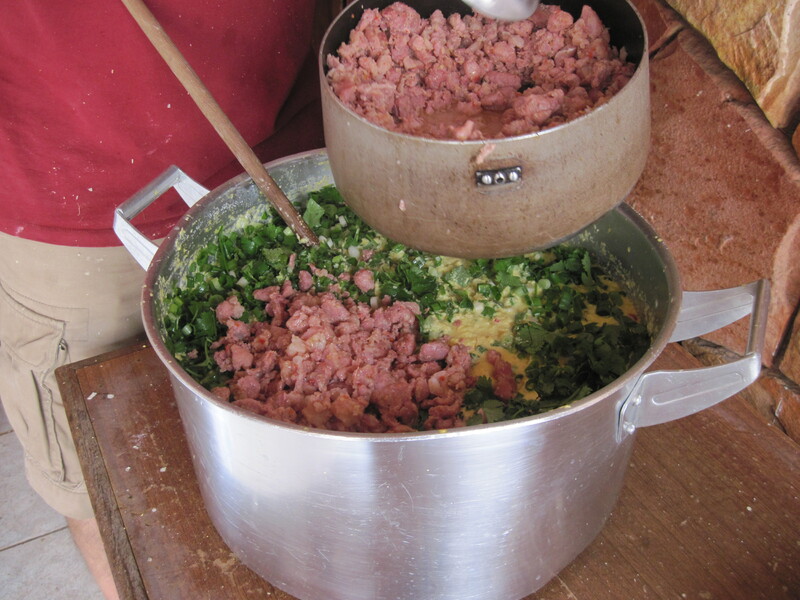 To the pot of amoda, we added all the herbs and pork sausage. mmmm. It’s starting to look tasty. Then came the really tricky part. 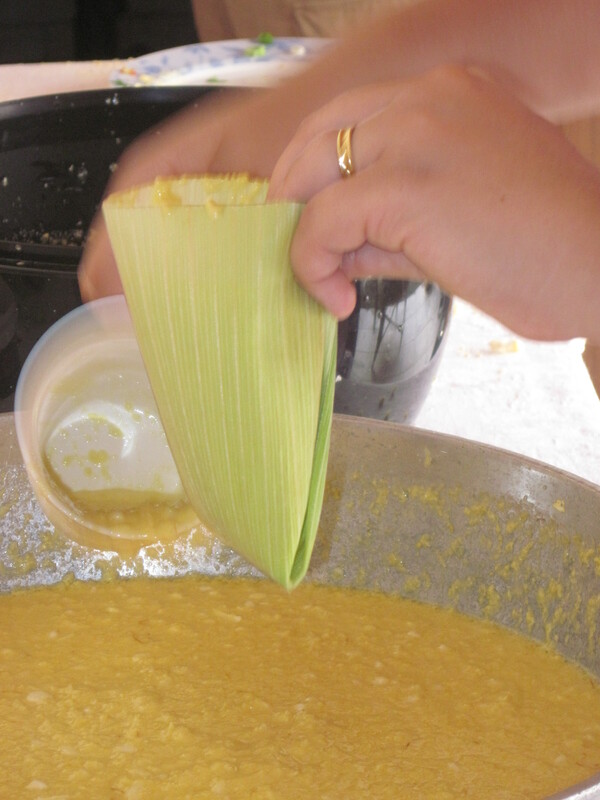 Our hostess demonstrated how to fold the corn husks into neat little pockets, pour in the corn filling, stick a big piece of cheese in the middle, wrap another husk around the top, and secure with a rubber band: pink for amoda, yellow for sal, and blue for doce. Hold the pocket together tightly while filling to minimize the inevitable leaks. 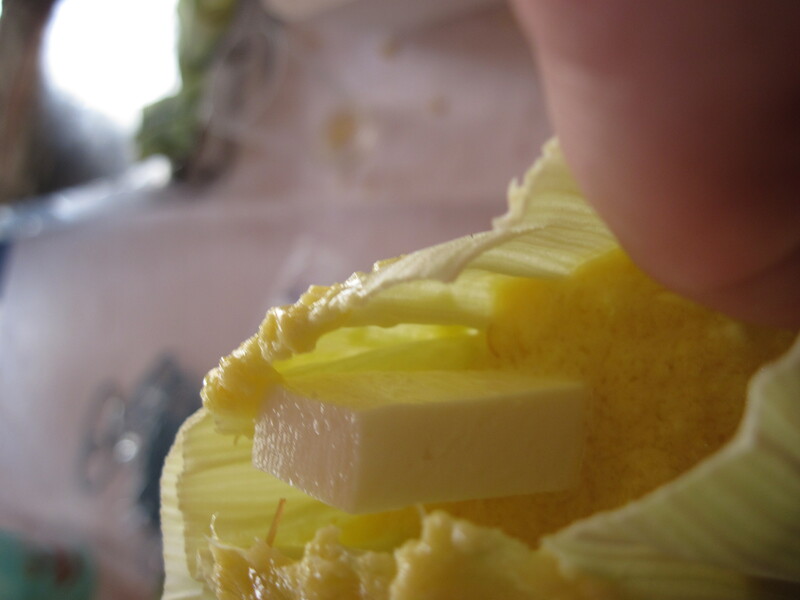 Do not forget to put the cheese in there. 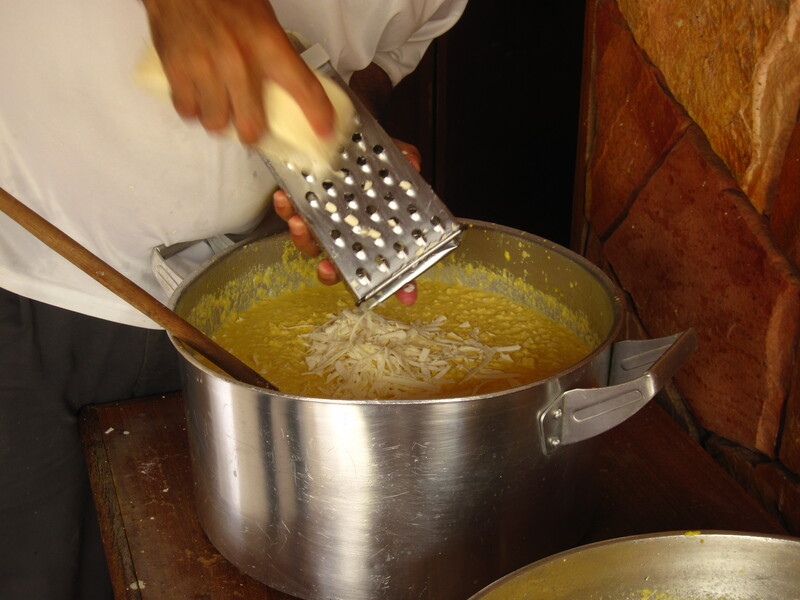 No Brazilian will be happy without the cheese. This may have been tricky and messy, but it went fast with all the adults working on it. We made 135 in all. 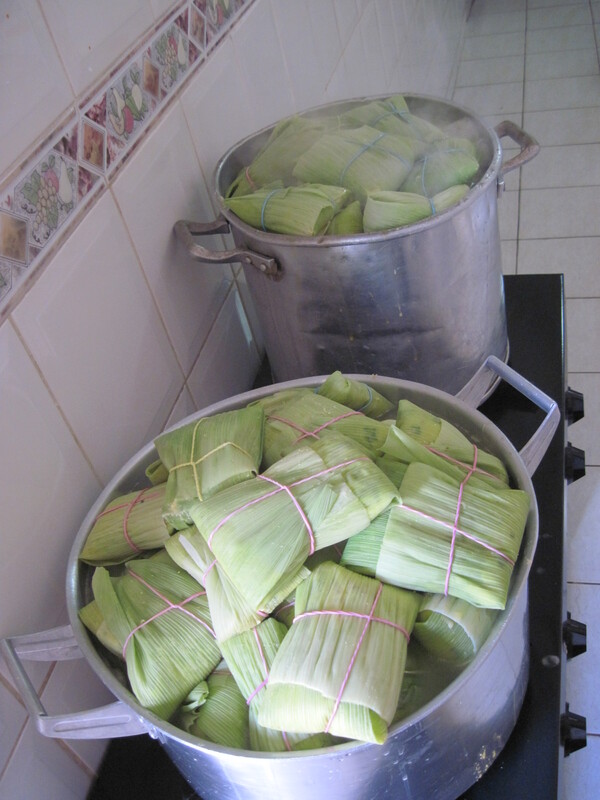 We boiled them in two very big, very full pots for 40 minutes. Our host had bought this double burner stove especially for pamonha. At 1pm, it was time to eat. Doesn’t that look good? Don’t you want one now? Out of the 135 that we made, we ate around 35 all together. These things filled us up quick. After two, most of us were stuffed. Our host insisted that we take home as many as we want. The rest, he was going to give out to his friends and family. It was a feast enough to feed a small village. And there you go. 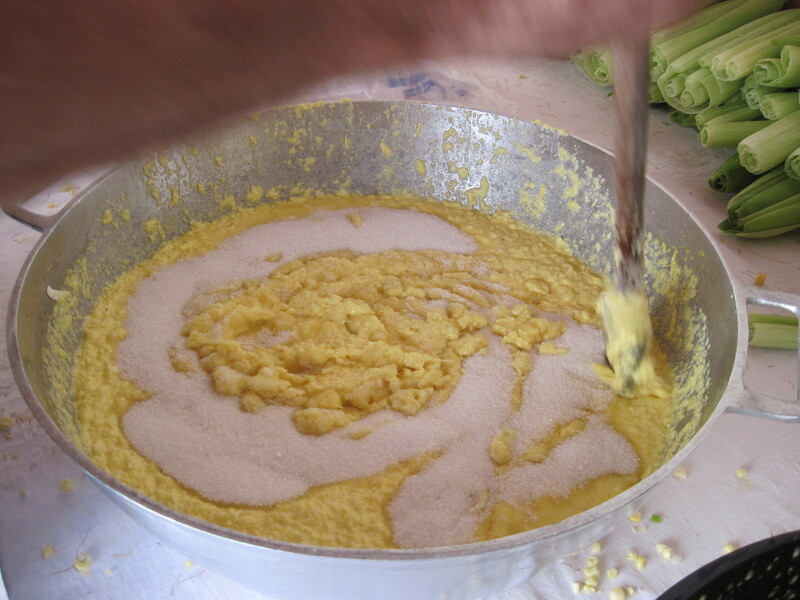 Now you know how to make your own pamonha. So grab some families–perhaps your neighborhood–and start shucking. Is the corn sweet corn or regular field corn? Good question. A few of us were trying to figure that out. 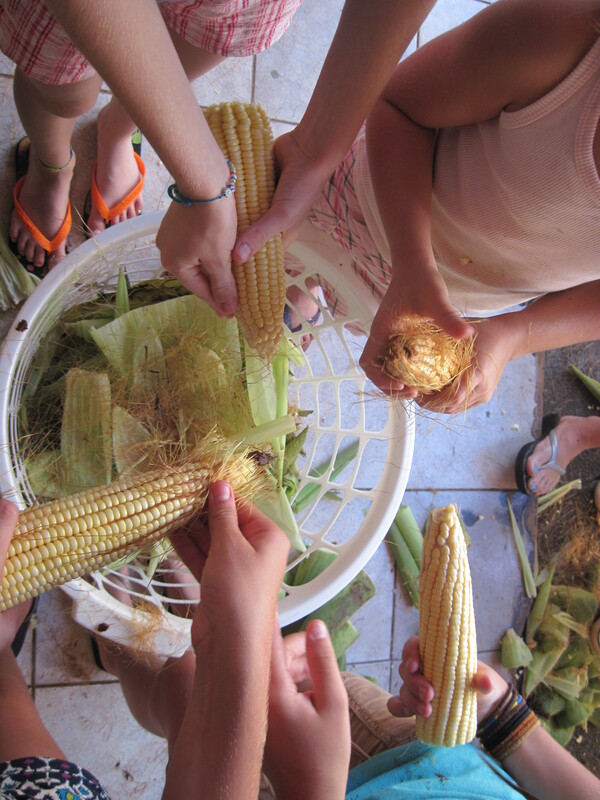 This is Brazilian corn which is just different because it’s Brazil. I think one of the guys said that if you harvested sweet corn much later than American’s usually do, it’d taste more like what this does. I don’t know anything about corn, so I’m gonna go with what he said. This was just amazing! Did the whole pot of pork fat go in there? If so that’s why two filled you up! Honestly, this could easily qualify for Freshly Pressed. Half the fat went in to each giant pot of corn.